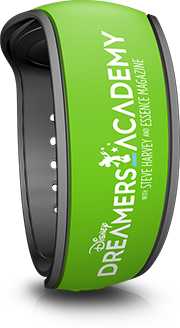 The Disney Dreamers Academy has again held an event for 2018 from March 9 – 12, 2018, and again in 2019 from March 21 – 24, 2019, and in keeping with tradition with past years, attendees again received special MagicBands. For 2018 the band graphics have been updated to reflect the new logo for the program. 100 kids get chosen per year to attend Disney Dreamers Academy, and it’s very difficult to be a part of the DDA group, as you have to apply and be accepted by Disney based on specific qualifications. for 2018, in changing with the past, only the kids (and not the parents/guardians) were given one of five different MagicBand colors: orange, purple, blue, green, red. For 2018 all other attendees who were not kids were given a gray MagicBand, and for 2019 it was teal for invited guests and black for media. Each band has a new Dreamers logo on it. The kids were teamed up in groups for the event based on their colored bands. Some MagicBands have a name on the back and some don’t. There are probably no more than 20-30 of of each color given out this year besides gray, which was probably given to roughly 120 people. This color with this logo design has been used in 2018 and 2019 so far.